Heat a large nonstick skillet over medium-high heat. Add oil to pan; swirl to coat. Add steak to pan; cook 2 minutes, searing on one side. 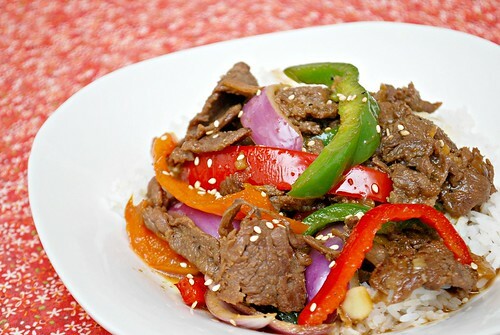 Add bell peppers and onions; cook 2 minutes or until beef loses its pink color, stirring constantly. Remove beef mixture from pan. Add soy sauce, vinegar, ginger, and chili garlic sauce to pan; bring to a boil. Cook 1 minute or until slightly thickened. Add beef mixture to pan; toss well to coat. Sprinkle with sesame seeds. I love a quick, easy meals like this one! So fresh and colorful! I have not made pepper steak in ages. Something about this recipes says I should do something about that. Thanks for the recipe. Great meal for a weeknight. 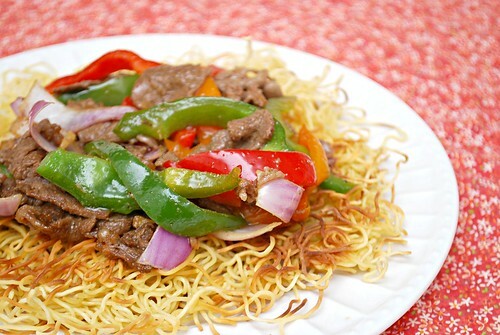 I would definitely enjoy the crispy noodles too. I love stir fried! I always order this from the chinese restaurant nearby!